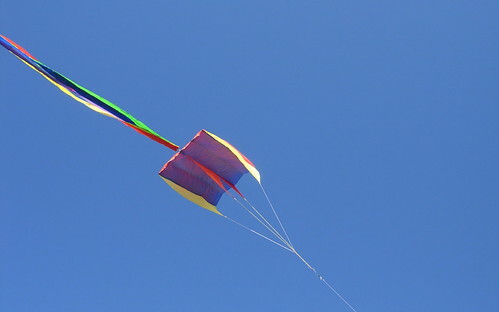 My kite is a simple, wonderful thing. There’s very little like holding onto a kite in a steady breeze. I am the kite’s anchor, and my hands are the only thing keeping it from lurching away into power lines or maybe a nearby tree. There are hesitant kites, ones where I’ll have to run down a field or a beach to get them into the air; but that’s a different, sweaty kind of kiting. 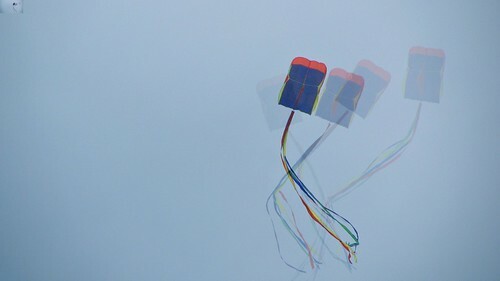 If the day has granted me enough wind, a kite will leap out of my hands into the air. My job will consist of unreeling the cotton line, then standing there holding on tightly. Such a kite is hungry for string. Despite knowing that I’ll need to reel it all back later, it’s so much fun to set a kite free, letting the kite rise higher and higher towards the sky. A kite in its natural habitat will make its keeper look up. It doesn’t belong in a bag or a closet or a drawer. In storage, it’s not really a kite—it’s a mass of brightly-colored cloth. Seen against the bowl of the sky, it becomes beautiful: Braces are holding the fabric taut, nylon parachute cells are inflated by the wind. Its tail streaks and flutters behind, pointing at where the kite really wants to be. Yet I don’t allow that to happen, because I selfishly keep it where I can see it—for its own safety, of course. The kite we put up on our walls as decoration is posed as if it were flying, but its tails point limply towards the floor, a prisoner of gravity and plaster walls. As pretty as it is, has become a lesser being—until we cut the nylon line holding it to the walls. We recently went to the Jersey shore and released our parafoil, letting it shudder in the wind for an hour or so. The meditative experience of holding the kite in place is peaceful, analogous to riding a bicycle on a tree-lined path for miles, or watching the sea on an empty winter beach for hours. It’s hard to describe and there’s nothing else quite like it.